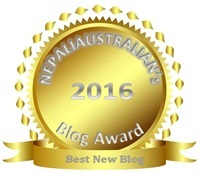 This has been the major highlight of the day for me: won in the Best New Blog Category! Thanks to all those who voted for my blog. It was fun blogging in 2016 as a newcomer in the blogging sphere, and this award has motivated to continue doing that in 2017 as well. Very excited and thankful!